The first arrivals were taken to tents for registration and health checks. 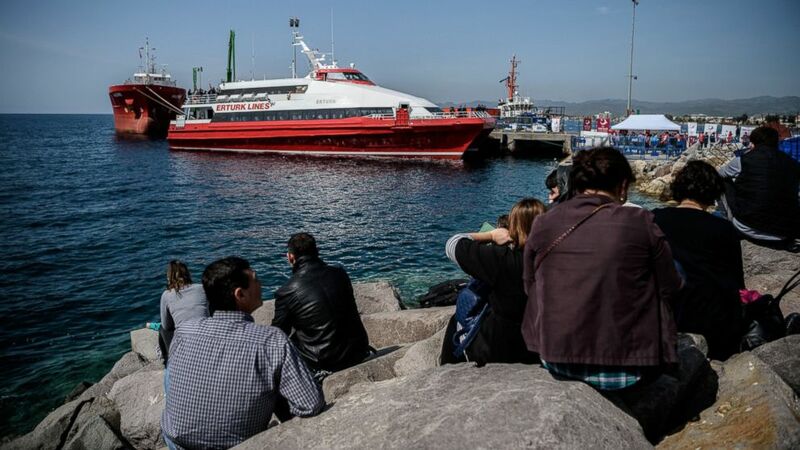 The first migrants and refugees arrived back in Turkey from the Greek islands of Lesbos and Chios this morning as a part of a new plan to limit migration to Europe. The migrants and refugees, heading in the opposite direction from what they had hoped, were escorted onto small ferries and taken to ports on the Turkish coast. One image captures Turkish police escorting deported women as they arrived at the port of Dikili district in Izmir, Turkey. (Ozan Kose/Getty Images) A Turkish police officer escorts deported women migrants from a small Turkish ferry carrying migrants who are deported to Turkey on April 4, 2016 as they arrive at the port of Dikili district in Izmir. Another shows some people gathered on a beach in Izmir watching others who were deported from Greece arrive on a small ferry. (Ozan Kose/Getty Images) People gather on the beach as migrants deported from Greece arrive aboard a small Turkish ferry in the port of Dikili district in Izmir, Turkey, on April 4, 2016. 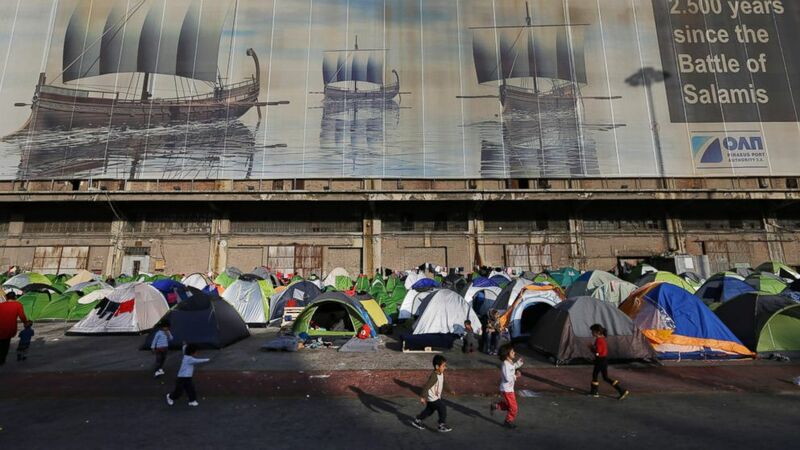 (Lefteris Pitarakis/AP Photo) Migrant children play at the Athens port of Piraeus, April 4, 2016, during the first day of the implementation of the deal between EU and Turkey. 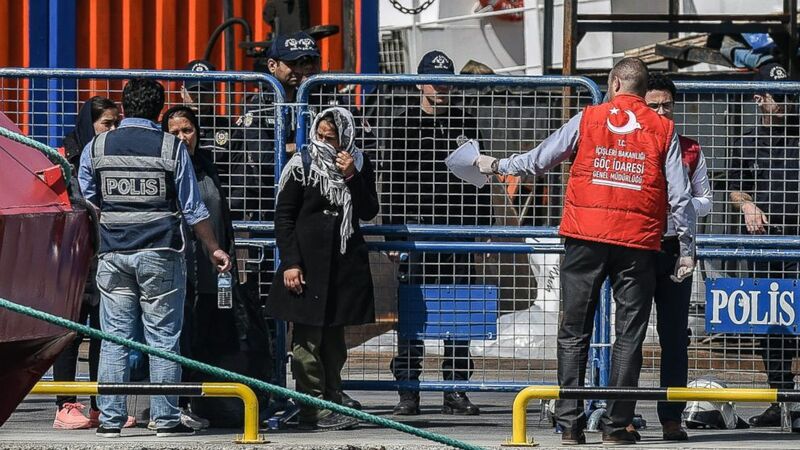 Turkey and the European Union agreed last month that migrants who arrive in Greece from Turkey illegally -- after March 20 -- will be returned to Turkey unless they qualify for asylum. For every Syrian turned back, a Syrian refugee will be sent from Turkey to the E.U. Today marked the first official day for the transfers. But some people still fled Turkey for Greece today, hiding in smuggling boats, Greek authorities said, according to The Associated Press. In Turkey refugees risk overcrowding, a lack of resources and the possibility of being sent back to Syria. Giorgos Kosmopoulos, head of Amnesty International in Greece, told the AP that Turkey is not safe for the refugees, calling this a "dangerous deal." "This is the first day of a very difficult time for refugee rights," Kosmopoulos said. "Despite the serious legal gaps and lack of adequate protection in Turkey, the E.U. is forging ahead with a dangerous deal." But Turkish Prime Minister Ahmet Davutoglu said police officers should show "compassion" to the migrants returning to Turkey, urging them to not "distinguish them from our own citizens."